Are you a coach (or parent) who's trying to teach pitching to a young player? Overwhelmed by all the different mechanical approaches, pitch types and drills? Looking for a simple, step by step solution that takes out all the guesswork, and shows you EXACTLY how to build a rock-solid pitcher from the ground up? 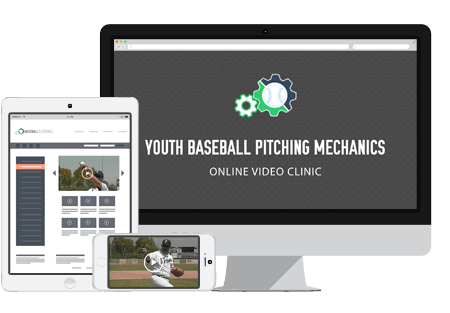 Introducing the Youth Baseball Pitching Mechanics and Fundamentals online video clinic. It's fast, fun, and easy to use. And it works for players and coaches of all ability levels. No experience required! The online video clinic is 76 minutes long, and jam-packed with specific tips and strategies for developing sound pitching mechanics... and improving your pitcher's velocity, control, and confidence on the mound. All while reducing the risk of arm injuries. This online clinic is designed for kids age 8 to 12, and recommended for beginner and intermediate level players. The focus is mostly on basic fundamentals, with additional material to challenge your more advanced athletes. This online clinic comes with a special 60 Day Money Back Guarantee. If for any reason, you're not 100% thrilled with the material, just send us an email within 60 days of purchase and we'll gladly refund you full payment. No questions asked.